The classic woodblock prints made famous by Hokusai and others depict a stylized, long-lost Japan. A chance encounter with woodblock printing at an exhibition in Toronto more than twenty years ago led David Bull down a path that has made him the only artist, Japanese or foreign, working to reproduce those classical prints. Bull gained initial attention in 1989 when he announced that he would reproduce the complete series of Edo-era ukiyo-e artist Katsukawa Shunsho's Hyakunin Isshu (One hundred poems from one hundred poets) over a ten year period, making the prints available on a monthly subscription basis. Readers may be familiar with this series as a popular New Year's game in which players, listening to a caller reading out the first half of a poem, compete to find the card printed with the rest of the poem fro among cards scattered on the floor. Until his fateful meeting with woodblock printing, Bull was enjoying a successful career in the music business. He had no formal art training, just a highly analytical and do-it-yourself drive that led him to obtain a block of wood and "grab a knife from the kitchen and start carving." The results of that first endeavour were "absolutely terrible," he laughs. With no knowledgeable instructors and precious little information in English on technique, Bull literally chipped away at things on his own, improving his technique bit by bit. By 1986, he had moved to Japan to further his craft, continuing to study on his own but also seeking advice from and developing relationships with professionals. Bull made ends meet by teaching English out of his home, but it was not until 1991 that he was able to become a full-time woodblock artist. The printmaker sees his mission not only as one of simply reproducing past works, but extending knowledge of the complexity and beauty of this art of a bygone era. Subscribers to his series receive, in addition to their prints and an explanatory note, a quarterly newsletter that examines various aspects of woodblock printing. Bull has also placed a great deal of effort into his woodblock.com website. 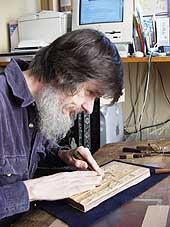 "My daughters and I have scanned, page by page, just about every available reference on woodblock printing that is free of copyright and put each one up on the site," he proudly offers. 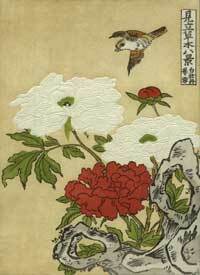 The site receives thousands of hits a day and is considered the definitive resource for Japanese woodblock printing. Bull also maintains an online discussion group, Baren, that draws participants from around the world. After completing the Hyakunin Isshu series in 1998, Bull began his next project, the Surimnono Albums, a collection of privately published prints from the Edo period. Poet-commissioned surimono prints were used to make announcements or given as gifts. (Ukiyo-e, on the other hand, were mass-produced for public consumption). The series consist of works of both well-known and unheard artists, based solely on what Bull considers attractive. In fact, this element of surprise is what keeps 80 percent of subscribers coming back years after year, according to the printmaker. "At my show each January, I exhibit the 10 prints I've produced over the past year. But I put 10 question marks up on the wall to represent next year's prints. It's kind of a joke," he laughs, "because part of the fun for subscribers is opening up their packages each month to see what I've sent them."